Andrew Dienes Dark Ambient, Experimental An ancient Middle Eastern mythology became the theme of musical explorations for many people in the world during the modern history. The artist that we are going to speak here about is well-known for all of those who seek for brilliance inside the sea of averagism which rule the industrial scene during the last decade. Don't repute me as a prone, the average albums and artists are needed at least to help to understand the difference between beauty and grey scale. What we have here today is the thick point in the end of the line, which reflects the deep dedication and hard work into what can be thought as the concentration of the best tunes in ritual ambient music. 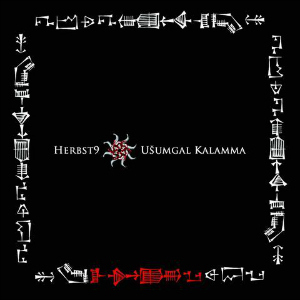 Usuamgal Kalamma (Dragon of the Land) is the latest creation of two guys, Henry Emich and Frank Merten, which is the 3rd item in Mesopotamian trilogy that was started by them few years ago with the album called "Buried Under Time and Sand". Mesopotamian culture as the cradle of civilization brought a lot of reflections into the music, because of its reach and colorful world of mystery and myth bound together with the history. Nurtured by the Tigris and Euphrates rivers, the lands of Sumer and Akkad bloomed with fertile thought. It was Sumertime and the living was easy - with plenty of spare time to doodle with amazing inventions such as commerce, writing and politics. One of the explorations was also the origin of the natural evil and its problem for the human kind from the religious and cultural point of view. The specific thought was carved into the milestone manuscript which has the major signification for that period, under the name "I will praise the Lord of Wisdom". It was taken by Herbst9 as the conceptual thought for their dual cd and parts of this poem can be heard through the chanting. The main idea of the poem is lament of a good man suffering undeservedly. Also known as `The Poem of the Righteous Sufferer', while a man cries out that he has been afflicted with various pains and injustices and, asserting his own righteous behavior, asks why the gods should allow him to suffer so. In this, the poem treats the age old question of `why do bad things happen to good people'. This idea also can be seen in more late creations inside the bible's "Book of Job". In order to feel the best experience we should at least try to learn the background of the tracks, which are presented in a beautiful decor of the box full of old Mesopotamian signs. The name "Dragon of the Land" is a significant revelation for the ancient civilization, as the vision of dragon has an important role for understanding and expression of evil .The album consists of two parts. First part is opened by the track under the name " She Filled The Wells Of The Land With Blood", full of mystical tunes , cymbalas , gentle but creepy vocals as the projection of the words of Inanna, goddess of sexual love , fertility and warfare. This first track is very important as the conceptual introduction, when Inanna was raped by the mighty Shu-kale-tuda and as the revenge she filled the land with blood, wells of the Land with blood, so it was blood that the irrigated orchards of the Land yielded, it was blood that the slave who went to collect firewood drank, it was blood that the slavegirl who went out to draw water drew, and it was blood that black-headed people drank. The music becomes very theatrical and less atmospheric as it moves towards the epic "Napissunu Mutumma", where a dark and deep melody is guided by drum beats, arising ancient spirits, voices evoking the dead, bells and acoustic surrounding. Following the second track, comes the milestone itself " Ludlul Bel Nemeqi" / I will praise the Lord of Wisdom. Morose layers of a background sound accompanied by the chanting of the poems from the manuscripts written thousands years ago, again the drum beating gives the rhythm and power in order to strengthen the words. As the story line moves forward, Inanna comes towards the mountain of Ebih, the sign of nature divinity which doesn't want to kneel before her, and brings the confrontation with the human divine. Inanna conjures Ebih with her words : "Mountain range, because of your elevation, because of your height, because of your attractiveness, because of your beauty, because of your wearing a holy garment, because of your reaching up to heaven, because you did not put your nose to the ground, because you did not rub your lips in the dust, I have killed you and brought you low"... I have made tears the norm in your eyes. I have placed laments in your heart. BIRDS OF SORROW ARE BUILDING NESTS ON THESE FLANKS!". A slow but still strong melody follows the chanting words, string instruments enter the scene, the ambience rises and falls showing the wide natural power. The surrounding atmosphere comes to outline the famine power and sexuality, while the album transforms to bring the last epic track "Ereskigal, Rise from Your Throne" that fills the air with its sensual power and density. As soon as Inanna reaches the gate of underworld seeking the unity with her dark twin side, Ereskigal , the keeper of the other side of reality, dark place, a home to deceased heroes and ordinary people alike. While the first cd brings a sound which is more familiar to the earliest works of Herbst9, the second one shows a gloomier and more ethereal side of the duo's creation. The mysticism and ancient culture are still here to saturate each corner and each flow of extremely wide and dark atmospheres. Ancient Mesopotamian myths are here to reveal the story of Nanna / Asimbabbar, a moon god, as it is reflected through the understanding of Henry and Frank to give it a new vision using the prism of modern industrial music. An ancient Middle Eastern mythology became the theme of musical explorations for many people in the world during the modern history. The artist that we are going to speak here about is well-known for all of those who seek for brilliance inside the sea of averagism which rule the industrial scene during the last decade. Don't repute me as a prone, the average albums and artists are needed at least to help to understand the difference between beauty and grey scale. What we have here today is the thick point in the end of the line, which reflects the deep dedication and hard work into what can be thought as the concentration of the best tunes in ritual ambient music. Many years of an exploration of cultural and historical aspects, combined with a creativity and never-sleeping energy of the duo , and once again Herbst9 brings an epic and truly cinematic work. With the investment of Loki Foundation they bring a piece of art that can enter the squad of so called "must hear" albums of ritualistic ambient music.